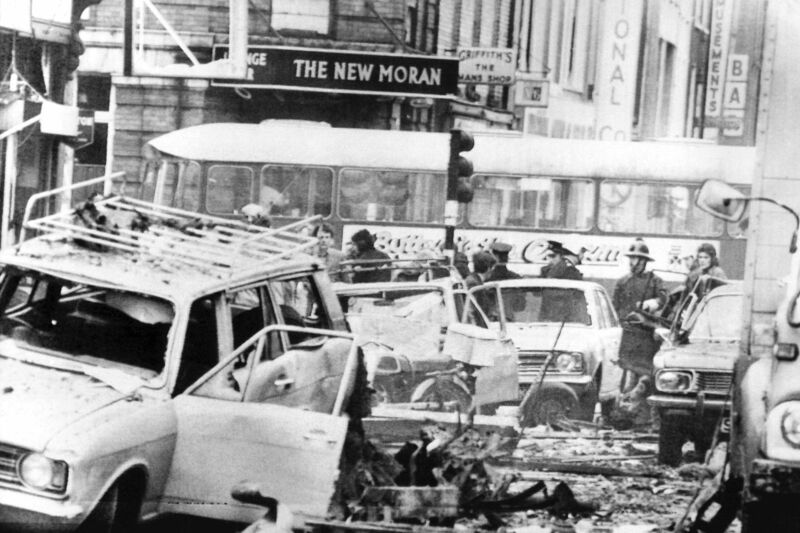 On May 17, 1974, a series of car bombs exploded without warning on the streets of Dublin and nearby Monaghan, Ireland. The bombs wreaked havoc on the two cities, causing an unprecedented number of civilian casualties and leaving behind a legacy of pain that lingers to this day. The Dublin/Monaghan bombings resulted in the greatest loss of life on any one day during the Irish “Troubles,” which lasted roughly from 1969 until the signing of the Good Friday Agreement in 1998. Amongst the 34 casualties were a pregnant woman carrying a full-term unborn baby, a family of four with two small children, and an elderly veteran who had survived the First and Second World Wars. More than 40 years later, in March of this year, a group of families of those killed and injured as a result of the bombings announced they were pushing for full disclosure from the British government in response to a legal challenge filed in 2015. Their lawsuit alleges that a notorious terrorist group called the “Glenanne Gang” carried out the attack with assistance from members of the British security services in Northern Ireland. The group has called upon the High Court in Belfast to order the British government to file their defence so their lawyers can gain access to important archive materials that may substantiate their claims of collusion. This March also saw historic elections take place in Northern Ireland, in which a record number of voters turned out at the polls and nationalists won their largest victory since the partition of Ireland in 19211. Alongside this shift in power, the issue of how best to deal with the legacy of the past has arisen once again. Though the British and Irish governments, along with eight Northern Irish political parties, signed the peace deal which ended the conflict in 1998, it did not contain a definitive plan for the acknowledgement of victims and truth and reconciliation. There have since been three major attempts to lay the foundation for a truth recovery process, the most recent of which was outlined in the 2015 Fresh Start Agreement but has not been implemented. In the absence of a formal process, relatives of victims, survivors and their supporters continue to fight on, pursuing all avenues available to them in their pursuit of justice. The Dublin-based Justice for the Forgotten (JFF), made up of survivors and relatives of those killed in the May 1974 bombings, is one such group. Since its official formation in 1996, JFF has worked tirelessly to shine some light on the world of shadows that cloaks the atrocity, exposing corruption, malfeasance and, as it happens, collusion between the British state and loyalist paramilitaries. Their journey and the unresolved case of the Dublin-Monaghan bombings presents a particularly egregious example of the constant struggle that victim-survivors face in pursuit of the truth about what happened to their loved ones. And yet, despite the carnage and the fact that evidence has emerged linking members of the British security forces to the atrocity, no one has been held accountable for what was one of the darkest, bloodiest days in modern Irish history. Last May, a small crowd of supporters gathered alongside bereaved families and survivors for a wreath-laying ceremony at the site of a memorial in Dublin’s Talbot Street. The annual event commemorated the 42nd anniversary of the bombings. Indeed, it still seems unfathomable that a bomb could go off in a major European city, claim the lives of more than 30 people and injure hundreds more, while the perpetrators remain unpunished. Though a preliminary police investigation yielded the names of 20 suspects, no one was ever questioned—let alone charged—with this heinous crime. How could this happen? Why would the powers that be allow justice to remain elusive to the victims of such a horrific tragedy? JFF have a theory: Their evidence suggests that a group called the “Glenanne Gang,” made up of loyalist paramilitaries with assistance from members of the British security forces, carried out the bombings. They believe the group (named after the farm where the group allegedly met to plan their attacks) was ultimately responsible for the murder of more than 120 people. They argue that the British government is hiding behind the mantle of “national security” to prevent allegations of their own agents’ complicity from coming to light. Armed with their evidence, JFF are determined to break the silence that surrounds the atrocity and expose the cover-up that has prevented justice from being served these 40+ years later. Many of the survivors of the Dublin/Monaghan bombings are quick to describe the deafening silence that seemed to last an eternity following the explosions that rocked the two cities. A victim injured by a car bomb on Talbot Street, 1974. McNally had just run to the door when she heard the first bomb go off, and was turning back inside when the Talbot Street bomb exploded. There was a big flash in the sky, and for a second McNally thought it was thunder and lightning. In the immediate aftermath of the bombs, thick smoke and dust made it nearly impossible to see. After the dust began to dissipate, screaming, wailing and crying punctuated the stillness. People ran around everywhere, searching for loved ones, looking for help and attending to the injured and dying. McNally was one of the lucky ones. She had survived. Meanwhile, as McNally sought medical attention, many families waited in vain for their relatives to return home. Many households lacked telephones, so it took quite a while before news about people’s whereabouts in the wake of the bombings reached their families. Hundreds of people showed up at the city’s hospitals, pouring over remains in search of their loved ones. And then, within days, the funerals began. None of the families of those killed or the hundreds injured were prepared for the utter lack of response to the atrocity by the authorities and the Irish government. Some of the victims, like McNally, were visited in the hospital by detectives and questioned in the immediate aftermath, but any follow-up ended there. There was no national day of mourning, no statements of sympathy from the government and no funds set aside for the dependents of those who were killed. Unlike the families impacted by Bloody Sunday in 1972, when 14 unarmed civilians at a Civil Rights march in Derry were killed by the British Army’s Parachute Regiment, the families of those killed and injured in Dublin and Monaghan had no common purpose for being where they were when the bombs went off. According to Urwin, very few of the families knew each other, so there had been no coming together over the years for support. Dublin, 1974, hours after the bombing. Still, despite support from family and friends, it was difficult for her. Most of McNally’s wounds were superficial, but she had suffered severe injuries to one eye that would leave her blind on her left side. Although her doctors wished to remove her eye at one point, McNally says she was not psychologically capable of parting with it at that stage. Her left eye would finally be removed in 1998. To this day, she continues to have reconstructive surgery once or twice a year. Almost 20 years would go by before the families affected by the bombings would find an occasion to come together to share their experiences of the day. Although the major loyalist paramilitary groups initially denied responsibility, eventually a group called the Ulster Volunteer Force (UVF) admitted that it carried out the bombings. Formed in 1966, the UVF’s mission was to maintain Northern Ireland’s position as part of the UK and to defeat the Irish Republican Army (IRA). Many at the time took the UVF’s admission at face value. As time passed, however, people began to ask questions: was the UVF acting on their own, or did they have help? In her ground-breaking book, Lethal Allies: British Collusion in Ireland , Anne Cadwallader, journalist and caseworker for the Pat Finucane Centre for Human Rights, says that rumours began to surface in the early 1990s that the UVF may have had help from British security services. Who, then, was ultimately responsible for the atrocity? And why were they not apprehended in the aftermath? “Hidden Hand” served as a catalyst for the formation of JFF. For many of those directly affected, it was the first time they had received any real account of what had actually happened on the day of the bombings and their immediate aftermath. As a result, people began to reach out to one another to share their experiences. Following a few years of ad hoc meetings, JFF was officially formed in 1996. At the outset, the group thought that there might be a possibility of securing prosecutions for those responsible for the carnage, yet the vast majority of the families now accept that that is unrealistic and are instead focused on getting to the truth of what happened. Members of JFF set their sights on three main issues: the alleged involvement of the British security services; the lack of action on the part of the Irish government in going after those responsible; and the integrity of both the RUC and Garda (Irish police) investigations. JFF’s work led the Irish government to hold two non-judicial inquiries into the circumstances surrounding the bombings, which produced the Barron Report (2003) and the MacEntee Report (2007). Reflecting on JFF’s work to date, Urwin says, “The most important thing is that the British have refused to cooperate” with their inquiries and requests for information. For example, during his investigation, Judge Barron was unable to gain access to any original documents from the British government. JFF has been fighting for access to these ever since. Both inquiries also revealed shocking levels of mismanagement in the handling of the investigations. The MacEntee report exposed the fact that many documents had gone missing from Garda files, and due to the lack of sufficient systems in place at the time, it is impossible to assess how many more files are untraceable. The missing files leave it hard to know definitively why the Garda’s investigation ended not quite three months after the bombings. In 2015, JFF lodged a civil suit against the British government with the hopes that they might move to a point of discovery where they might receive documents showing evidence of collusion. Gavin Booth is a Belfast-based attorney who has worked on the case. “The British state could easily offer money to make this go away and not admit liability, but the families don’t want that. They want the truth. They are taking civil cases because it is the only form of truth and accountability that we can get in this jurisdiction. Since the Good Friday Agreement, there hasn’t been anything put in place to effectively deal with the past as of yet,” Booth explains. In March of 2015, Cadwallader testified at a US Congressional hearing on collusion chaired by Rep. Chris Smith (R-NJ). In the case of the Dublin/Monaghan bombings, she alleges that the British government chose not to share information about the identities of the bombers with the Irish government so as not to embarrass the Crown. Though some make the excuse that the selective administration of the law is sometimes necessary in times of violent conflict, Cadwallader argued that in such circumstances it is that much more important to uphold the principle that no one is above the law. “Once you tailor the means to meet the ends, no matter how laudable, you’re on a slippery slope. We contend that London went down that slippery slope during the 35-year civil conflict in Northern Ireland, and that this rendered the British state culpable for at least part of the loss of life, the grief, the waste, the agony that the people of Northern Ireland suffered,” Cadwallader said. Though time passes slowly, support for the “little people” continues to grow. U2’s song “Raised by Wolves,” on Songs of Innocence, is a reflection on the day of the bombing, as seen from the perspective of a childhood friend. During their world tour, the band projected JFF’s banner and photographs of bombing victims each time they performed the song. Though thrilled with the exposure, for the most part days go by quietly, and members of JFF find strength in one another as their campaign for truth moves forward with no end in sight. The U2 Concert in Vancouver, in remembrance of those lost in the Dublin/Monaghan bombings, 2015. Until they reach their ultimate goal, JFF, and groups like them in communities throughout Ireland, are joining together to resist, to re-write an imposed narrative of their past, and to share their truths, and in so doing, are opening a crack in the shameful history of British collusion with paramilitaries during the Troubles. JFF is part of a growing movement in Ireland that believes that the best path forward for society to deal with the legacy of the past is an international, independent truth recovery process. The British government, by withholding critical information and refusing to admit their role, further traumatizes families who were already suffering as a direct result of the bombings. 1. Following the War of Independence, in which Irish nationalists sought to secede from the United Kingdom, the Government of Ireland Act (1920) established two separate parliaments in Northern Ireland (the six counties in the Northeast) and southern Ireland, thereby partitioning the country. 2. The Royal Ulster Constabulary (RUC) was Northern Ireland’s police force at the time. Kate McCabe is the director of Éist, an organization which cultivates and promotes first-person perspectives of justice and accountability in the aftermath of war. She received her master’s degree in Environmental Justice from the University of Michigan; while there she began a lasting commitment to work on behalf of victims/survivors and in pursuit of truth recovery in the North of Ireland. McCabe is a recipient of the Irish Echo's 40 Under 40 Award. She is a former National President of the Irish American Unity Conference, and in this role organized the first and only Congressional Briefing on Irish Language Equality and was the only American to make a submission to the Eames/Bradley Consultative Group on the Past. McCabe is a graduate of the Harvard Program in Refugee Trauma. She currently sits on the board of Irish American Writers & Artists in New York City.